LASIK is the most frequently performed elective surgery in North America. This highly effective outpatient procedure is often referred to as refractive surgery or laser vision correction. Myopia (Nearsightedness) occurs when your eye is too long in relation to the curvature of your cornea. This causes light rays entering the eye to focus in front of the retina, producing a blurred image. Hyperopia (farsightedness) occurs when your eye is too short in relation to the curvature of your cornea. With hyperopia, distant objects are seen more clearly than near objects. Astigmatism occurs when your cornea is shaped like an egg. With astigmatism, more than one focal point within the eye distorts what you see. As a result, you experience a tilting of images due to the unequal bending of light rays entering your eyes Astigmatism. The LASIK procedure is performed by ophthalmologists, medical doctors who specialize in surgical treatments of the eye. CONTOURA Vision is the latest FDA approved LASIK technology available in the U.S for laser vision correction. CONTOURA Vision improves upon the traditional Wavelight LASIK procedure by using today’s most advanced mapping technology to map the unique contours of the surface of your cornea. The scanning procedure samples up to 22,000 elevation points on each eye to create a unique vision profile for you, and only you. Everyone’s eyes are different. A pre-procedure consultation with your doctor will help determine the right type of laser eye surgery for you. Custom LASIK is a laser vision correction procedure that helps your surgeon customize the laser treatment to your individual eyes. This procedure may result in your vision being clearer and sharper than ever before. 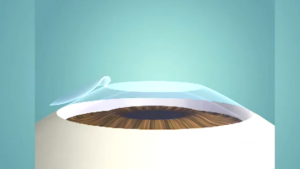 Bladeless LASIK uses a gentle laser to create a precise, uniform corneal flap. As the name implies, no blades are used in this customizable eye surgery. Wavefront Technology creates a customized map of the unique attributes of your visual system that transfers to the laser, enabling your LASIK surgeon to address your individual visual requirements. Wavefront technology is used in custom LASIK surgery. Postoperative Management and Fees Final results from LASIK depend not only on the qualifications of the surgeon and the technology he or she uses to perform the procedure but also on the patient following all pre- and post-op instruction and steps. This includes the postoperative management instruction that patients receive from the surgeon and technical staff during the weeks and months following the procedure. Because fees for LASIK vary greatly from center to center, it is important to discuss postoperative costs with the surgeon performing your procedure. We offer upgrades to Contoura and Intralase technology for additional costs. We will quote you the cost after a Consultation with Dr. Zeldes. We are very competitive without sacrificing results. Scheduling your free consultation with Dr. Steven Zeldes of Lasik Specialists of Michigan is as easy as filling out a simple form.